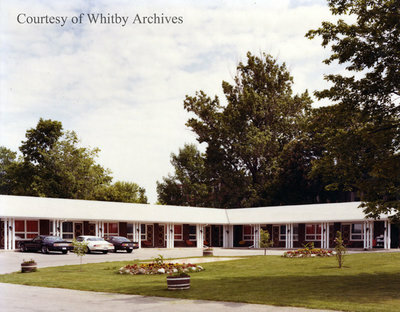 Colour photograph of the Canadiana Motel in Whitby. In 1960s the Canadiana Motel replaced the tourist cabins at the Algoma Tourist Camp. The Canadian Motel is located at 732 Dundas Street East, opposite where Lupin Drive meets Highway 2, east of Garden Street. 26 motel units close to commercial area"
Canadiana Motel, ca. 1983, photographer unknown. Whitby Archives photograph D2016_004_006.